ECI’s student research assistants are given the opportunity to develop and enhance their research and writing skills through hands on research projects. Students in the research and writing program also have the opportunity to have completed research projects published in the ECI Interdisciplinary Journal for Legal & Social Policy, law reviews and/or other law journals, as well as policy pieces. You will be assigned research topics based on your interest and ECI works in progress. Student researchers should take the time to read the Student Research Manual that are available under the ECI student resources link below. The manual provides a road map for your research and provides helpful information that ranges from developing an outline through the editing process. Student researchers meet weekly with their research supervisor as well as submit work product weekly for editing and comments. Students are expected to work a pre-determined number of hours at the ECI office. ECI’s student attorneys are given the opportunity to gain real world experience while working in a mentoring environment. Student attorneys have the opportunity to work in the Opal Mitchell Lee Property Preservation Project or the ECI Juvenile Justice Project. You will work with experienced attorneys who will involve you in all aspects of handling a legal case. You will interact with clients and opposing attorneys, prepare pleading, and participate in court hearings. You will learn about proper case and file management practices. You will be expected to work at the ECI offices at specific times as determined in conjunction with your supervising attorney and the Associate Director responsible for your project. You must meet with your supervising attorney and other students assigned to your project at least once weekly in a group meeting. Preference for clinical positions is given to 3L students. Prior to the end of each semester, for consideration in the following semester, download and complete the ECI Student Application form below and submit the completed application along with a copy of your transcript, a cover letter and a brief writing sample (3-5 pages) to Ms. Jeanetta Washington, ECI Administrative Assistant, in person at the ECI offices, via fax at 713.313.1153 or email to the Earl Carl Institute at earlcarlinstitute@tmslaw.tsu.edu. Students may not apply for positions until they have completed their first year. The Earl Carl Institute for Legal & Social Policy, Inc. (ECI) operates the Texas Southern University Thurgood Marshall School of Law Innocence Project (TMSLIP). The following information explains how you can apply to become a part of the TMSLIP team. Administrative Assistants are hired each semester as paid positions to assist with handling intake and other correspondence related to TMSLIP work. Student Investigators must participate in the TMSLIP by registering for the Innocence Project Clinic and Course. In addition t attending the class, IP students must work in the clinic a total of 120 hours over the course of the semester. The class size will be limited to 10 – 12 students and the grades are letter grades. Professor Anthony S. Haughton is the Innocence professor and the supervising attorney for the innocence clinic, supervising students work on innocence cases, as well as conducting investigations of pending cases. Prior to the end of each semester, for consideration in the following semester, download and complete the IP Student Application below and submit the completed application along with a copy of your transcript to Prof. Haughton at ashaughton@tmslaw.tsu.edu or the Earl Carl Institute at earlcarlinstitute@tmslaw.tsu.edu. Once all applicants are interviewed you will be notified if you are selected for the innocence project clinic. If selected, you must register to take the Innocence Project Clinic and the Innocence Practice course. ECI accepts volunteer law students, law graduates, paralegals and attorneys, as well as experts and student interns from other disciplines to work in any of our clinics or to provide support on any of our research and writing projects related to our policy advocacy efforts. In addition, we accept operations volunteers to assist with fundraising, financial compliance issues and marketing efforts. All positions are subject to interview requirements and a firm time commitment to the Institute You will serve as an independent contractor to the Institute. You are expected to carry yourself professionally at all times. It is also expected that your work will be of the highest quality. The Earl Carl Institute (ECI) is looking for all areas of clerical assistance and data entry. The Earl Carl Institute (ECI) is looking for grant writers and other resource development specialist to assist with securing new funding sources to help advance and expand the operations of the Institute. The Earl Carl Institute (ECI) is looking for marketing/branding assistance with increasing the visibility of the Institute through social media and other forms of outreach. The Earl Carl Institute (ECI) is looking for licensed and unlicensed attorneys to assist the Thurgood Marshall School of Law Innocence Project. Typical duties include: Working under the direction of the Project’s Associate Director, in investigating, preparing and litigating Actual Innocence Claims through Writs of Habeas Corpus, and may include supervision of law students in the same. We are requesting that attorneys be able to donate at least five hours a week and make a minimum eight week commitment. Experience with criminal law is preferred but not necessary. The Earl Carl Institute is looking for paralegals to assist the Thurgood Marshall School of Law Innocence Project. Paralegals are expected to work directly under the supervision of the Project, in investigating, drafting legal pleadings (through Writs of Habeas Corpus), preparing correspondence, memoranda, case notes, maintaining files, opening and closing client files and providing all other administrative support as assigned. The position is likely to entail working with law students in the same. ECI is requesting that paralegals be able to donate at least eight hours a week and make a minimum twelve week commitment. Experience with criminal law is preferred but not necessary. 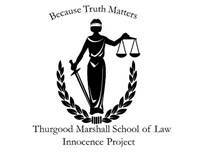 The Earl Carl Institute is looking for 10 students to assist the Thurgood Marshall School of Law Innocence Project as student interns each summer. Student interns would work on investigating and preparing actual innocence cases for litigation, or on administrative functions as needed by the Project. Students will work under the supervision of an attorney. Typical duties include: data base searches, document collection, witness locating and interviewing. Students must be able to commit at least 30 hours per week over the course of the summer. An orientation will be given at the start of the semester and training is provided throughout the semester. The Earl Carl Institute (ECI) is looking for licensed and unlicensed forensic experts to assist the Thurgood Marshall School of Law Innocence Project in the fields of psychology, psychiatry, crime scene reconstruction, pathology, arson, DNA, fingerprints, eyewitness testimony, false confessions, hair microscopy, and other forensic sciences. Complete the application here and email it along with a resume to the Institute at earlcarlinstitute@tmslaw.tsu.edu.